Every toilet partition requires miscellaneous replacement parts from time to time. At Centar Industries we have all your replacement parts required to keep your restrooms operating at peak capacity. 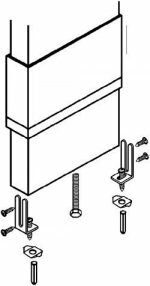 Floor shoe 1-3/4" x 1-3/4"
Headrail end plug 1-1/2" x 1"